warning: Creating default object from empty value in /www/htdocs/w00b2987/sites/all/modules/pathauto/pathauto.module on line 116.
strict warning: Declaration of filefield_handler_field_data::options() should be compatible with views_object::options() in /www/htdocs/w00b2987/sites/all/modules/filefield/views/filefield_handler_field_data.inc on line 44. 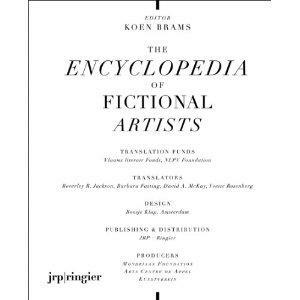 First published nearly a decade ago, and here translated into English for the first time, The Encyclopedia of Fictional Artists is a project by author and editor Koen Brams, for which he commissioned and compiled an anthology of imaginary biographies based on the numerous artists invented by writers across the centuries, from the beginning of the seventeenth century to the present. The imaginary artist is, of course, a supremely seductive figure to readers, writers and artists alike, being a sort of screen upon which the most astounding imaginary creations may be projected, without need of them ever being visible to the eye. As such, The Encyclopedia of Fictional Artists constitutes a trove of inspiration for all manner of creative endeavor. The Addition is Krist Gruijthuisen's editorial answer to the Encyclopedia, in which he invites more than 20 artists to reflect on the aspirations and ideals of encyclopedias. The two volumes are held together by a bellyband.